OUR PRICE: $73.10 - Join Rewards Get $7 Dance Dollars On This Item! 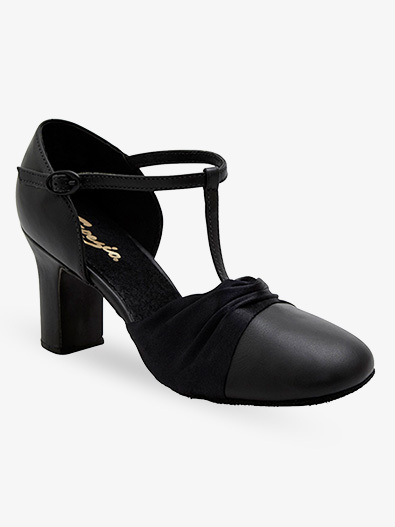 2.5" character shoe features an attractive buckle T-strap, an open arch, and enhanced flexibility through vamp. Suggested Fitting: Order same as street. If you have bunions or wide feet these will fit much more comfortably than most character shoes. The stretchy satin around the ball of the foot is very flexible but still keeps your foot in the shoe. Durability may be a bit of an issue but the comfort makes it worth it. I wear 6.5 W street shoe and these fit perfectly. The heel is exactly 2.5 in. For comfort, this shoe gets an A, but this is definitely a 3" heel character shoe! I was so disappointed about that, since I am 5"8" and don't need to add 3 inches to my height on stage. If you have bunions and are looking for a shoe that will not aggravate them, this it. I did not comment on the durability as I had to send the shoe back. The customer service rep was very helpful and very sorry that it was not as advertised and I did not have to pay for return shipping. As for size, I wear a size 9 and the size 9 shoe fit me perfectly. Make sure you really get a shoe that fights...snug around the curves of your foot, because if you don't, the shoe WILL look bulky. 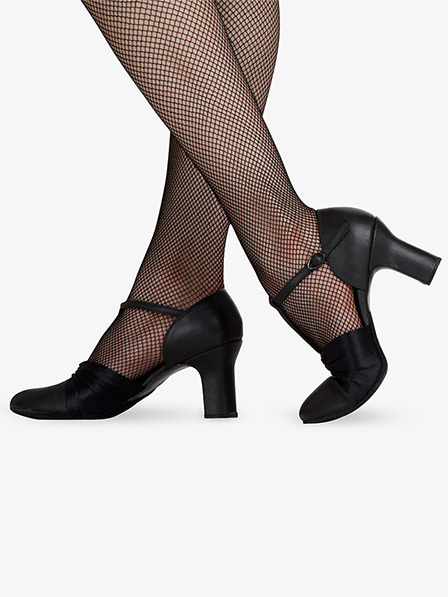 I got mine fitted at the Capezio store and had to go through about five or six pairs. I have a 8.5 shoe size and in these, I'm a 7. They dance like a dream! The sole is suede, though, so if you're on a slippery dance floor, water won't save you! Just be careful. They look amazing and are comfy. These shoes are listed as a street shoe fit, however from experience, this shoe can tend to run a about a size larger depending on the foot.